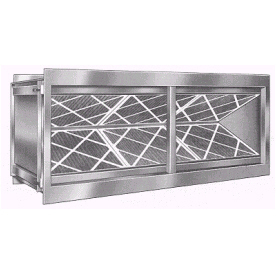 V-bank filter housings are constructed as a rugged one piece assembly for side service installations. Completely factory assembled, they are ready for installation in a minimum amount of time when received at the job site. 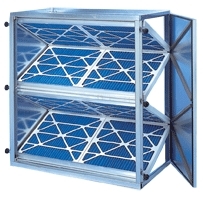 Filters are installed in a V-bank arrangement permitting double the air volume compared to flat bank housings with the same size opening. V-bank housings are only 27-5/8″ deep (2″ filters) or 28-5/8″ deep (4″filters). 16 gauge steel with welded construction allows the standard units to operate at pressures up to 7.0″ W.G. High pressure units for applications operating up to 10″ W.G. are available.